In President Trump’s recent State of the Union, millions of listeners heard him tout his love for “beautiful, clean coal,” something that, as The New York Times editorial board noted, “remains a mirage” for those of us living within the confines of reality. What is a happening right now—and what politicians supporting coal are desperate to avoid discussing—is the problem of black lung, a deadly lung disease that develops from inhaling coal dust. Now, epidemiologists at the National Institute for Occupational Safety and Health say they’ve found the largest cluster of advanced black lung disease ever reported (the cluster was first uncovered by NPR just over a year ago). According to a research letter published Tuesday in the Journal of the American Medical Association, 416 cases of progressive massive fibrosis (PMF) were found in three central Appalachian clinics between 2013 and 2017. PMF is the most severe form of coal workers’ pneumoconiosis (aka black lung disease). 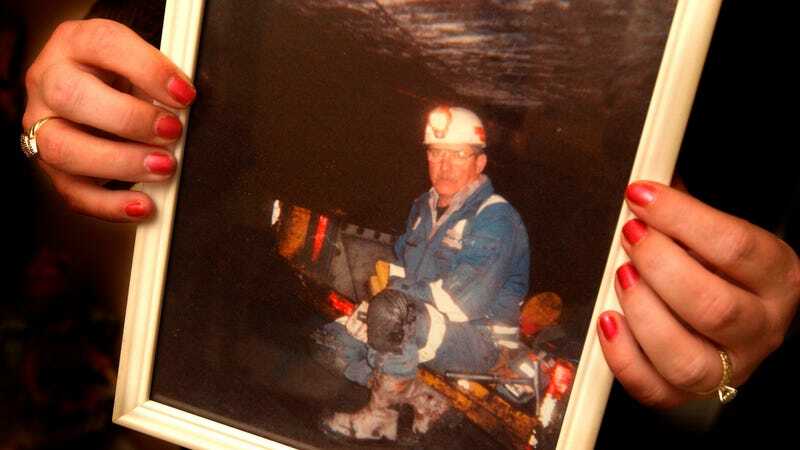 More than 76,000 miners have died of black lung since 1968, according to statistics from the U.S. Department of Labor, however the prevalence of PMF fell sharply after implementation of the Coal Act and reached historic lows in the 1990s. Today, roughly one in 14 underground miners with more than a quarter century on the job (and whom submit to voluntary check ups) are diagnosed with the disease—a rate nearly double that from the disease’s lowest point from 1995 to 1999, according to a 2013 analysis. Ron Carson, director of West Virginia’s Stone Mountain black lung program where the clinics are operated, told NPR that they are seeing something they haven’t seen before. “When I first implemented this clinic back in 1990, you would see ... five [to] seven ... PMF cases” a year, said Carson. Now that many can come through every two weeks. PMF causes miners to gradually lose the ability to breathe, and if you listen to the story on All Things Considered you can hear the pain and angst expressed clearly in the interviews. There is no cure other than a lung transplant, and that requires patients to be healthy enough to go through with a serious procedure, not to mention somehow affording it. While comprehending the full scope of this epidemic will require further research, one worrying trend is that the disease seems to be striking younger miners—in their 50s, 40s, and even 30s—who have been exposed to coal dust for fewer years. This week’s NPR investigation determined that longer shifts and thinner coal seams—which means machines cut rock with coal, thus creating even more toxic silica dust—are the likely causes of the epidemic. The increase in diagnoses may also be the result of miners that’ve been laid off or are retiring going in for overdue black lung check ups. In what adds injury to insult, the Trump administration’s Office of Management and Budget is reviewing an Obama-era rule that protects coal miners from exposure to coal dust. The Respirable Dust Rule, which came into effect in 2014, adds a number of increased protections for coal miners while also closing several loopholes that masked exposure to unhealthy coal mine dust, according to the Mine Safety and Health Administration. Seems this administration will sacrifice anything—or anyone—to roll back a regulation.